Kitchen Designs for Doll Houses. Approaching different rooms in your miniature structure may require you look into your own imagination and literally seeing yourself living in your dollshouse. How better to decorate, choose, plan and design your mini world than to picture what you want to have present there. Ask yourself, what would make me comfortable if I lived here? Basically ask yourself key questions about the kitchen designs you desire. Don't stop until you feel satisfied that you have made the best choices for your doll mansion. After all it is your doll's home you are designing. What you want should rule the day. This is a great place for your imagination to kick in. What have you always wanted in your own kitchen designs? Picture it, plan it and place it in. These are the steps you should take to accomplish what you desire. Spend a bit of time imagining your perfect kitchen designs. You do it for other things, so why not here? Key Question: Is your dining area present day or from some other century? Look for the details that make your ideal environment come to life. Right before your eyes. If this is an earlier time frame does your cook area have a range that burns all day? What kind of stove would that require? Picture it now.... how does your dining area fit into the rest of your construction plans? Is it a place where everyone is comfortable so family life seems to be centred there? During the day do people work there and in the evening does the family gather there for tea? 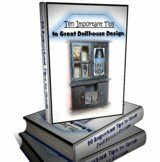 If you are doing a doll's house from an earlier era it is helpful to read information on these kinds of dollhouses. "...most cottages from earlier eras (my input, in black) had a scullery where the messier jobs were done, the dining area was used as a place to cook and eat but it was also the living room, as the best parlour was reserved for Sundays and special occasions." Quote from "Making Dolls' House Interiors in 1/12 Scale" by Carol & Nigel Lodder. Okay!... All of your most important questions asked and answered? Great... now let's get started on a plan. Put all that you envisioned into the final results. Does everything fit nicely together? Is there something that just cries that it is out of place? Now... even though it did not fit... reserve that idea for another style of dining area and move on. Begin building your ideal dollshouse cooking area! Visit our Toy Shoppe for furnishings..... and books..... for ideas on dining wares, or miniatures. Designing your ultimate doll house cooking area is so very creative. My advice to you is: Let your imagination go to help create your perfect dining area atmosphere. Always believe in yourself, your ability to create and that you can do it.